The full video of the ride through Makuhou Road. During the week I started getting a real hankering for a decent ride - the Connie had new tyres and they needed scrubbing in so I had a decent excuse to get out (not to mention fabulous weather). By Friday I had decided that Fields Track was to be my destination and by bed time last night I'd even thought that if I hit the road early enough I could even take in the Forgotten Highway making it a fairly decent ride indeed. Well, I didn't get up too early but managed to be on the road by 8:30 with Fielding set as my first stop to fill up an empty tank. Curiously I got 22.5L into my not empty 22L tank which did cause a bit of head scratching (who was right: Kawasaki or the oil company?). From Fielding I carried on through Halcombe and then Marton. Out of Marton and onto Makuhou Road I had my run-ins with the four legged locals (but enjoyed most of that fabulous road) before popping back out onto the main road. From here I planned to turn off again for Fordell and make my way towards the Para Para's but cruising up one of the passing lanes I heard a funny noise from behind me and looked in my mirrors to see my topbox lifting off and then sliding across the road. Amazingly it didn't even bounce and just slid clear across the road until it hit the gutter on the other side. Luckily there was no traffic either behind me or coming the other way and it made it's way across safely - also, if it wasn't for the gutter it would probably have got airborne and destroyed itself. My first Friday night ride in a wee while. Just a quick squirt over Vinegar Hill and then back again followed by a feed and plenty of yarning at the Ashhurst Inn. Really nice night out although the bugs were out in force. A little chilly riding home without liners in my gear. Dropping the Connie off to get new shoes today I had a couple of options offered up as a way to get to work: a FXR150 and a 650 V-strom. Obviously I thought long and hard, weighed up the pros and cons and eventually settled on the V-strom. Actually it was a bit more simple than that - I'd wanted to ride a V-strom for a while as I've heard great things about them and pottering around on back roads, paved or unpaved really appeals to me - my lucky day. The guys had the bike warming up for me so all I had to do was throw a leg over and get rocking. The seating position felt very familiar as it is not far off what I've experienced on Bandits and the Connie - a nice upright riding position with plenty of leg room. The handle bars are also in a nice comfortable position with all the usual controls easy to get at. The bars could perhaps be rolled a bit further forward to put them in an even more natural position - probably something very easy to do. Pulling away I noticed that I wasn't on a 1400 anymore but the little twin was very impressive in it's performance and the clutch action was very light (especially compared to the VTR). Commuting to work was great fun: that nice high riding position giving a good view, the engine quite happy to sit on 3,000 rpm in fourth to bring up around 50-60km/h and the nimble handling making it a breeze to flick around corners. Around town 4,500 to 5,000 rpm was plenty between gears to get the bike accelerating at a reasonable rate and the brakes while not startling were well up to their job and backed up by ABS. Suzuki claim a curb weight of 220kg and while this may sound quite heavy it certainly didn't feel that way when under way (and even when manoeuvring in and out of parks etc). The handling did feel like a trail bike in that you could just throw the bike into a corner but the front end felt far more planted than a trailee - probably that 220kg and less aggressive adventure tyres on the bike. A ride of about 6km is hardly a test so I managed to sneak out of work a bit earlier and take the bike for a quick squirt out on the open road but unfortunately not enough time to go in search of some corners or maybe a gravel road. Out on the open road I gave her the odd squirt up to around 7,000 rpm and this gave plenty of acceleration and also a nice little growl out of the two into one exhaust. At 100 km/h the motor is pulling around 4,500 rpm and another 500 rpm adds another 10 km/h and puts the motor in quite a sweet spot. The engine is very smooth here but you do still know you're on a V-twin - quite nice actually. Getting stuck behind a car at about 90 km/h the DL surprised me by accelerating very cleanly without the need for a downchange - no bogging down at all. It really is a sweet little mill that perhaps does punch above it's weight - certainly the 600 Hornet I rode a while go would prefer to be ridden harder to give similar performance. As mentioned previously I did not get the chance to ride through some more challenging corners but the handling on the open road was absolutely fine. It's hard to say how great the screen is as it was a very warm day and any cooling from the wind was welcome. There was a bit of noise from the screen but I did not notice any nasty buffeting that I have heard talk of although once again it was a very nice day with no wind. A while ago I put Pirelli Angel ST's on the Connie after hearing some good things about them. Tomorrow they come off to replaced by Michelin Pilot Road 2CT's. The Pirelli's initially felt great on the bike. The bike felt very nimble and the tyres performed well wet or dry. In fact throughout the time they've been on the bike the front has not given me any cause for concern. Before leaving on the Grand Challenge and Four Points the tyres looked great with what looked like plenty of life left in them. But on the first day of the Four Points I felt that the rear tyre was misbehaving itself and wandering around a bit on the road - this was mainly on the East Cape road where bumpy corners are the rule not the exception but also evident further on in the ride when the tyres were getting pushed a bit. Then in Rawene we got a big surprise. Looking at Brian's rear Angel there were cords poking through the rubber and his tyre had also looked good when he left home. We then looked at mine and were amazed at the wear that had occurred in roughly 1,500km. While on the ferry we managed to locate a tyre in Kaitaia for Brian's Connie and I spent the rest of the trip observing the rapid wear on my tyre. I made it home and now the bike is booked to get new PR2's tomorrow so I'll be a lot happier knowing that I should be good for another 12,000km. The Angels have just under 7,000km on them and the rear is toast with the front not far behind. Yep, been out for a little ride after tea to pick up the tag. Very warm and calm night - I need to take the liners out of my gear! Another surprise was the old man coming down from Napier on Friday night to join Mark and myself on the ride. So it was two twins and a Bandit meeting up at 7:15 for the start - that is, until we were joined by Graeme from Napier on another Bandit. After signing on we were given the route and basically told that we could take off whenever we wanted. The route was to take us to Wanganui, Raetihi, Tokoroa, Taupo and Napier before returning back to Palmy. We weren't told what route to take but had our odometer readings taken and also had to get receipts at four different stops along the way. Leaving Palmy we took a bit of a detour to avoid the uninteresting ride over to Wanganui by riding through to Halcombe and then taking Makirikiri Road across to Turakina. Then there was just a short squirt on SH3 before we turned off the main road again to go to Fordell and then Okoia allowing us to bypass Wanganui and get to the Paraparas sooner. The ride over the Para's was fantastic (as usual) and it was neat to be riding the Honda through here for the first time. By the time we got to Raetihi (the first checkpoint) things had warmed up quite a bit and I was glad to have the chance to remove my sweatshirt and grab a cold drink. The next leg of the trip took us across to National Park and then over SH47 to Tokaanu (where Dad departed for home) before climbing up over the delicious Kuratau Saddle. Going up the saddle we did get stuck behind a bit of traffic for a while but once past the cars we had a great run all the way to the turn-off to Whakamaru. At the turn-off a number of the other riders were parked up having a chat but we continued on behind the lake and thought that we were making pretty good time until the others came whistling past us. Just before Whakamaru we were stopped by some road works for a while and I used the opportunity to put on my sunglasses as the sun was well and truly up and blazing down on all the motorcyclists in their hot riding gear. 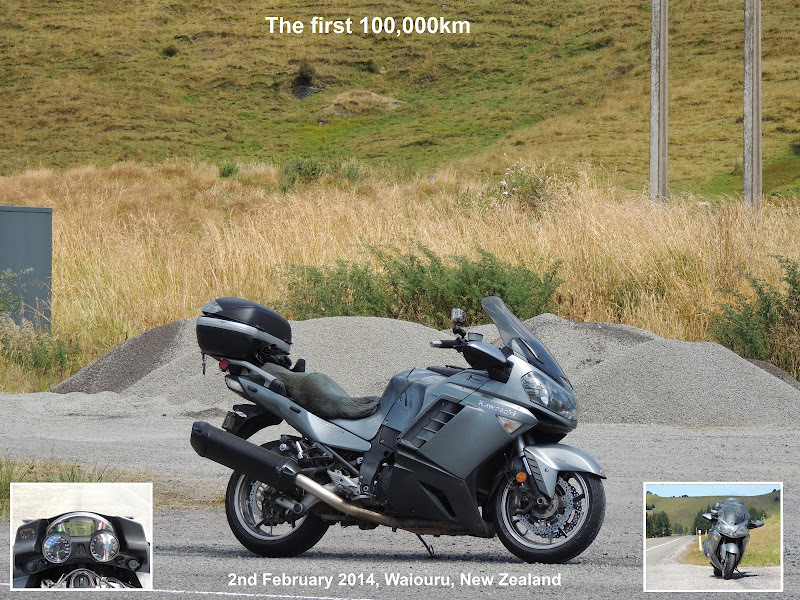 From Whakamaru it was just a short 30km pootle up the road to Tokoroa and the next checkpoint. All the other riders were there already and the garage was doing a roaring trade in petrol and pies. We just filled up and set off for Checkpoint three in Taupo. 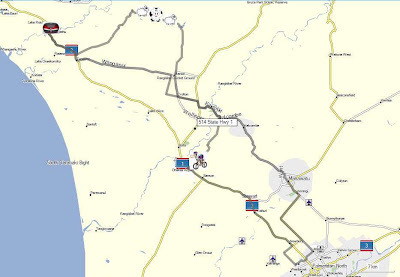 This short hop is a pretty boring ride down SH1 where we kept the pace down as it's a bit of a happy hunting ground for the boys in blue. In Taupo we didn't need petrol so stopped in at the local Subway for a bite before hitting the Napier-Taupo road. After pootling across the Taupo plains we eventually got into the hilly, bendy bits which make the Napier-Taupo a great ride and had a blast gobbling up the kms to Napier. Napier was our last stop for petrol and here Mark and I also swapped bikes for the trip home so he too could also experience the astounding touring capability of the might red Honda. As for myself, well I had to get used to riding a Bandit again and it took me a while to get comfortable - ducking in behind Mark as he took to "the hill" on SH50 helped and I was soon enjoying the charms of a Bandit once again. Yesterday was the fourth running of the Capital 1000K Cruise and so to maintain a perfect attendance record I had to drag myself out of bed at 4am make my way to the Hutt for the kick-off. In drizzly conditions I rode into town to fill the Connie and meet up with Mark, Meanie & Monie. Also joining us was Matt, heading down to Christchurch on his little 250 - I didn't envy him riding that far with a huge pack on his back. Shortly after 5am we were on the road South, all hoping that the rain would do the decent thing and leave us alone. In fact, not long out of town the rain did stop although we had wet roads all the way to Paraparam where the rain came back with a vengeance and brought along it's friend, the wind! It was actually very cold and nasty (heated grips definitely pressed into action) and I decided to flag Paecock Hill concerned that it might be really windy up on top of the hill - as it turned out nobody else was worried about that little decision. We arrived at C1KC GHQ just before 7am and very quickly organised our entries etc and were back on the road again. The weather was still showery but the Rimutakas were in good condition and there were no nervous moments at all as we made our way over the hill and into Featherston. all sorts of riding conditions. In fact, the very first section was quite interesting, there were branches down all over the place and we had to take things very carefully as we picked our way around them. Porangahau we pretty much had dry roads. In Waipuk we passed a number of riders who were gassing up and then in Waipawa we turned off the main road to make our way through to Patangata. In Patangata we took our photo but as we were getting ready to leave again we struck trouble. Monie discovered that her key would not turn in the ignition of her Viffer. We all had a wee bash at it, even holding our tongues in different positions but to no avail. Damn, one dead bike! Meanie sent Mark & I on our way and got onto the phone to the bike shop. Unfortunately, they were not able to help so the two of them rode back to Palmy to grab the spare key and the ute. The new key didn't do the job either so the poor wee Viffer had to be loaded onto the ute for an unceremonious lift back home - Meanie and Monie's ride all over. In Wairoa Mark and I stopped for some lunch and I had another check of my tyre - more curses to it's makers and more doubts entering my mind. In fact I started making plans to pinch my old man's SV in Napier or to swap to the VTR when back in Palmy depending on how long the tyre lasted me. phone/CD/newspaper etc and get it back under control before they killed a motorcyclist. Unfortunately I was not packing a grenade launcher so I had to make do with a blast on the Stebel and a big head-shake at the idiot behind the wheel. Mark and I had another quick stop in Woodville to check the tyre and decided that it was still hanging in there so continued onto Ashhurst and Colyton - home country. Passing through Colyton we picked up another four bikes and they dropped in behind us for the ride through to Pemberton for the next evidence photo. Next up was a quick squirt through to Ohingaiti for the last photo and pretty much the end of the ride for us. While there we caught up with a few of the Wellington riders before climbing back onto the horses for the last leg back home to Palmy. Another great ride although a reasonably long one - it took us about 13 and a half hours whereas we usually can cut out 1,000km in around an hour or so less than this. The extra time required this time around is more than likely down to the wet conditions (on a road that demands respect - Route 52) earlier on in the day. Never mind, all home safe and sound after a great Cruise! Zumo stats: 1,038km; moving average 88.8km/h. Saturday night was the prize giving for the Four Points Compass Rally and so I went along with Mark and a few of the Ashhurst mob to try my luck. Unfortunately my luck was all bad and no prize for me. Yod was far more lucky winning two prizes with his joker and three jacks - lucky sod! Oh, and Geoff - I am working on my write-ups! I had a quick squirt over the track on Friday. I also went through to Balance and had planned to come back via the Saddle only to be turned around due to the Targa Rally using my piece of road. So I was forced to turn around and come home via the Gorge.